November has come and the golden-red hope of Autumn is rapidly turning to bare trees and chilly winds. It is a cold time to lay a coffin in the ground. We sat in a small chapel at the Massachusetts Veteran’s Cemetery in Winchendon, Massachusetts. Winchendon is the town where I was born, where I took my first breath outside the womb. Now it is the town where my dad’s earthly body is buried. The chapel at the cemetery overlooks a sloping lawn going down to graves lined up like hundreds of large dominoes, representing many families and uncountable losses. 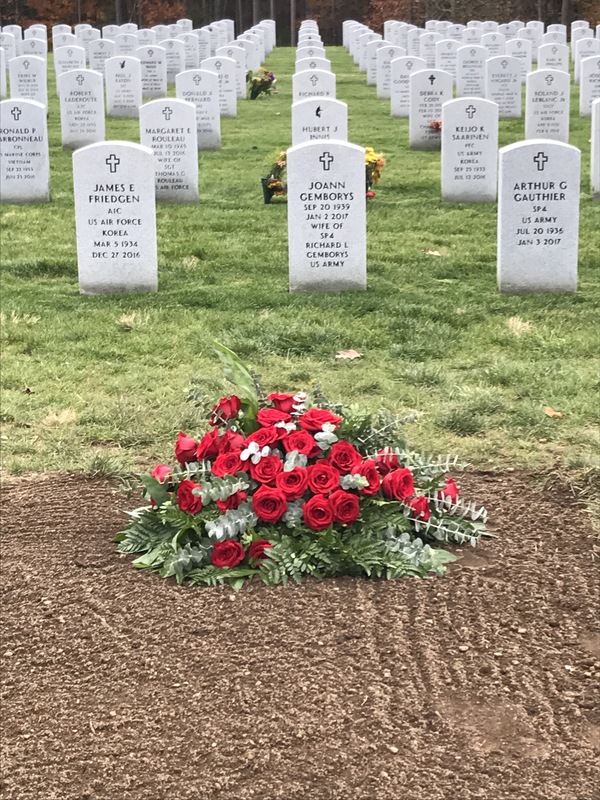 My dad’s gray casket dominated the front of the chapel, a cascade of bright red roses on its cover. The service was short and scripted, a fitting service for a burial. I smiled at the salutes my father received from those military men in the audience. He would have loved it! Though we never saw him as a military man, his two years of service after high school afforded him a free education, a burial spot, and military salutes. After a reception at a nearby church, a couple of us headed back to the cemetery. The dirt was fresh and a small marker indicated where the headstone will stand when it is ready. The flowers from the casket had been placed at the head of the grave. We stood silent. This was our final goodbye. I have been wrapped in the funeral cocoon, a cocoon of safety, where you are somehow aware that this is not the time to truly grieve. It is the time for memories, family, a celebration of life, and a funeral, but it is not the time to grieve. This funeral cocoon wraps around my mom and we marvel at her strength. But that is what the funeral cocoon does: It wraps you in grace and strength. Within the cocoon she can meet and greet countless people, respond to the constant ‘how are you doings’, eat and converse like she has a whole body instead of a body that she is supposed to live in even though it has been sliced in two. Anyone who has experienced the loss that death brings knows well this cocoon; a swath of strange, numb comfort that envelopes the grieving. The time will come when tears will fall until exhaustion takes over. The time will come to sit with the grief, to let it flow with abandon. The time will come to acknowledge the soul-deep ache of loss. But for now – the funeral cocoon is enough. Dear Marilyn, I’m so sorry for the loss of your Dad. Your writings these many years shine with family love, making your loss that much greater. I pray that you, your Mom, and all your family may go gently in these early days. Remember well. Hug often. Love much. I can relate. Thank you, Marilyn. Lovely writing. Truly resonated with my experience of loss. My mom grew up on Maple St. in Winchendon. We have many relatives buried in the same cemetery. Do you know the Ladeau brothers of Winchendon Furniture? My cousins! Thank you so much for these kind words and for coming by to read! I don’t think I know the Ladeau brothers, I lived in Winchendon for just two years of my childhood. The cemetary is absolutely beautiful isn’t it? Uncle Ralph is gone….the man who gave us the lyrics to our school song that we and all those that have shared our history sang with such gusto , so proud to be kids from M.C.S. I don’t have any special words, I know how I felt after losing my Mom and then my Dad but I can tell you this, that your my family , not by birth but by something that seems even stronger , our shared journey and that the stories of our lives have include each other, you are in my thoughts, I love you guys.I hope you will find solace in the many memories , in each other and in the love of your family spread out across this globe holding you close in their hearts. Marilyn the following quote says it better than I can. One does move on, but it is never the same. “There is nothing that can replace the absence of someone dear to us, and one should not attempt to do so. And even after all that, there will be many days when you’re plodding along wondering why the resto of the world is being so normal. Holding you in the light of love. Marilyn, I am so very grateful for the gift God has given you to express with words what many of us can’t. Thank you for sharing this precious gift.